I’m from an area of England called Yorkshire, and Yorkshire folk are renowned for being – shall we say – careful with their pennies, which means I’m quite a lover of a bargain. I’ve already made note of the fact that I’m no stranger to ‘bottom-shelf’ whskys, and that Benchmark is my go-to Bourbon. 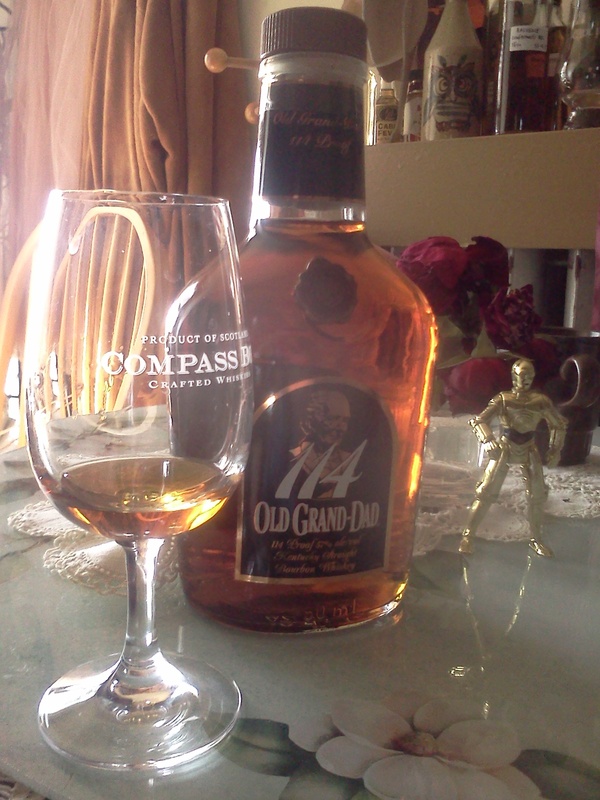 I also have a fondness for Evan Williams and Heaven Hill, which are both cheap-as-chips Bourbons, but the brand Old Grand Dad is a bit more unfamiliar to me. While it’s one of the 10 best-selling standard Bourbon brands in the US, it hasn’t faced the same popularity in the UK. That’s not to say it isn’t available but it is hasn’t reached anywhere near the same popularity as other Bourbon brands. That said, it’s described by it’s distributor – Beam Global – as “experiencing a resurgence” and with such a huge company behind it, perhaps it will also experience a global surge in popularity. Here in PA a bottle of the standard OGD will set you back between $15-20, compared to £25-30 ($37-45) in the UK. Needless to say my inner Bourbon fan is very happy with my current living situation, even if the Scotch single malt drinker is yet to adjust to the generally higher prices than I’m used to. As well as the traditional 86 proof there is also a BIB (Bottled in Bond) 100 proof version, as well as the focus of this post: the 114 “barrel strength”, which comes in at 57%. Speaking of “proof”, I often wonder if Americans are aware of how easy they have it when it comes to proof vs ABV. See, here the ABV is exactly half the proof, so 86 proof = 43%, etc. In the UK, the proof is 1.75 times the ABV so 43% would be a little over 75 proof. Similarly, 100 proof whskys in the UK come in at 57% ABV, not 50%. Confusing, eh? From what I can tell the 114 usually retails at around $25, but it was brought to my attention earlier today while I was geeking out reading whsky stuff online that certain PA liquor stores are currently selling it for $17.99 (apparently this might be to do with the fact that this expression is being discontinued, though I can’t find any evidence to support that claim. EDIT: It turns out that the bottle is being de-listed by the PA Liquor Control Board, and not being discontinued by the brand owners.) In order to satisfy my curiosity with the brand, as well as not being one to pass up a good deal (and a cheap ‘cask strength’ whsky) I picked up a bottle while passing through Nazareth earlier today. So how does it fare? Well, it certainly carries the hallmarks that you would expect from Bourbon with a pretty damn inviting nose that offers up a nice molasses-y/syrupy note that makes me think of pecan pie (man, I LOVE pecan pie) and an underscore of something savoury – maybe mesquite chips, or even the winning combination of sesame oil and soy sauce. I’m not getting much of the alcohol [wife disagrees! ], but that certainly comes through on the palate (without being overwhelming). There’s more light molasses and a toasted corn flavour that lingers on the finish. With a drop of water there’s a light citrussy note, but still that savoury Oriental note on the nose, and it mellows nicely in the mouth; now sweetness dominates the finish with just a touch of that soy sauce umami [wife agrees!]. The back label talks about the use of “more costly small grains” which I initially deciphered as “quick, we really need something to back up the extra cost for this bottle”, I.E. pure BS. However, the brand has quite a high proportion of rye in the mash bill (alongside corn) and I suppose rye is a smaller, more costly grain… Still, if they could write that on their Facebook page couldn’t they add it to the label, too?! Despite all that, at 25 bucks this is, on first impression, an outrageously good value Bourbon and at 18 bucks, well, if you can find me a better cask-strength whsky at that price then I’d have to assume it was some illegal distillate produced in a shed in the hills. My recommendation: pick up a bottle before they run out (which isn’t to say that they will run out… but they might! EDIT: They most definitely will! ).